It seems like economic fundamentals and earnings are in a heavy weight battle with the trade skirmishes to determine the direction of the stock market. It rallies when the skirmishes aren’t in the news and declines when new announcements are made. That’s the best explanation I can give for why stocks sold off sharply on Wednesday and then rebounded almost exactly the amount they fell on Thursday. The S&P 500 was up 0.87%. I’ve been discussing the relationship between the Dow and the Russell 2000 to show if trade skirmish fears are occurring. The Dow was up 0.91% and the Russell 2000 was up 0.39%. This tells us the trade war worries weren’t in play on Thursday. The industrial sector was up 1.12%, which also means trade war worries weren’t in play. Tech did the best as it rallied 1.79%. The FAANG stocks did well as Amazon and Facebook hit records a couple weeks ahead of their earnings reports. The tech sector and the Nasdaq hit record highs. The financials underperformed as they were up 0.19%. If the big banks report great earnings results, then the S&P 500 will hit a new record high in the next few days. That’s a big “if” because they mostly beat EPS estimates last quarter, but I wouldn’t count the reports as great because the equities didn’t respond positively. Sometimes stocks don’t rally a few days after they beat estimates because they were overbought heading into the report, but poor performance after 3 months tells us the reports weren’t great. To be clear, not everyone believes the trade skirmishes are the reason stocks have been stuck in a range for the past 6 months. Some believe that the yield curve is worrying investors about a peak in the cycle. Like I mentioned, the yield curve is widely watched. If you think a crash will occur a year after the inversion and you think an inversion is going to occur in 3 months, then selling now could make sense. You will leave some profits on the table, but you will avoid the losses incurred in the next bear market. The calculation entails figuring out how deep the losses will be in the next bear market. Obviously, if you think another +50% crash is coming then you should sell now. However, if the next bear market reaches a 30% decline, selling now and missing a big chunk of the end of the bull market might not make sense. To be clear, I stated the crash occurs 1 year after the inversion because many believe the stock market is forward looking. I think the stock market is a coincident indicator, but then again I also wouldn’t be bearish because of the yield curve flattening since it does well historically at this point in the cycle. As you can see from the chart above, the yield curve continued to come closer to an inversion on Thursday. The 10 year yield went up about one basis point because of the CPI report which showed strong inflation. Keep in mind, one basis point is a small move which makes sense because the report only met estimates. Beating estimates, would have led to a much higher jump. The 2 year yield increased over one basis point which means there was a slight flattening. The 10 year yield is at 2.8546% and the 2 year yield is at 2.5941% which means the difference is only 26 basis points which is the lowest of this cycle. The 2 year yield is slightly less than one half a basis point below the cycle peak. I have always said it will increase as the Fed raises rates. 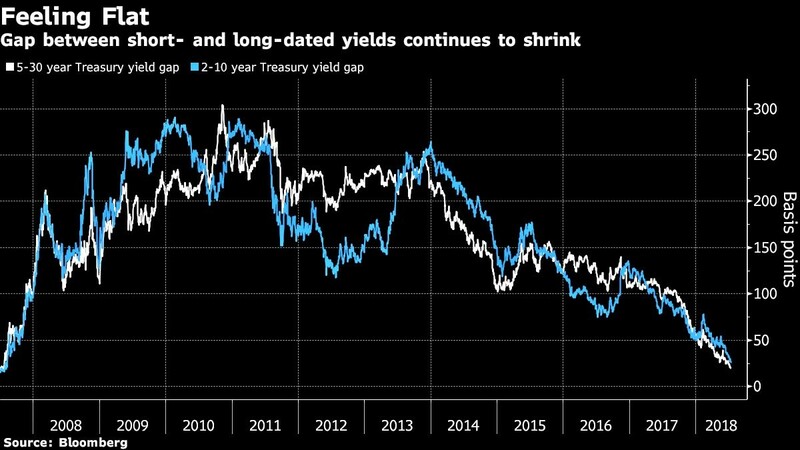 I am always interested in reading what others are predicting for the yield curve since it’s such an important indicator. There were predictions that it would never invert a few months ago. This prediction depends on how you start the assessment. If you are predicting where the 10 year yield will go and where the 2 year yield will go, you can come up with a wonky prediction for the curve which doesn’t have it inverting. If you base your prediction on the fact that the curve usually flattens during business cycles, it’s easy to expect an inversion. It might not be a perfect method to predict flattening just because that’s what has happened in the past, but it has worked for me this cycle. Getting to the prediction, Morgan Stanley expects the 10 year Treasury yield to be 2.75% by year end. This is down from the estimate of 2.85% by year end. To me, this seems like Morgan Stanley is following the market because the 10 year yield has been falling. That’s not ideal, but since predicting where the 10 year yield isn’t easy, it’s expected to occur. It looks like growth and inflation won’t get much higher, meaning 2.75% is a reasonable prediction based on the information we have today. Secondly, Morgan Stanley thinks the 10 year yield will fall to 2.5% by the second quarter of 2019, which will invert the yield curve. Growth expectations would need to fall for that to occur. Generally, when the curve inverts, growth is near its end, so that’s possible. In my opinion, this inversion forecast is very optimistic. Earlier in the year, I said an inversion will occur between Q3 2018 and Q2 2019. After seeing the speed of the inversion, I updated it to Q4 2018. I think the 2 year yield will move up to 2.7%, meeting the 10 year yield slightly below where it is now. This forecast assumes the Fed raises rates 4 times in 2018. If it raises rates 3 times, the 2 year yield will be stagnant. Four Fed hikes aren’t priced in fully which is the point. If they were priced in, then the 2 year yield couldn’t increase based on this action. The Fed could decide to change policy based on the yield curve, but that hasn’t happened ever before.